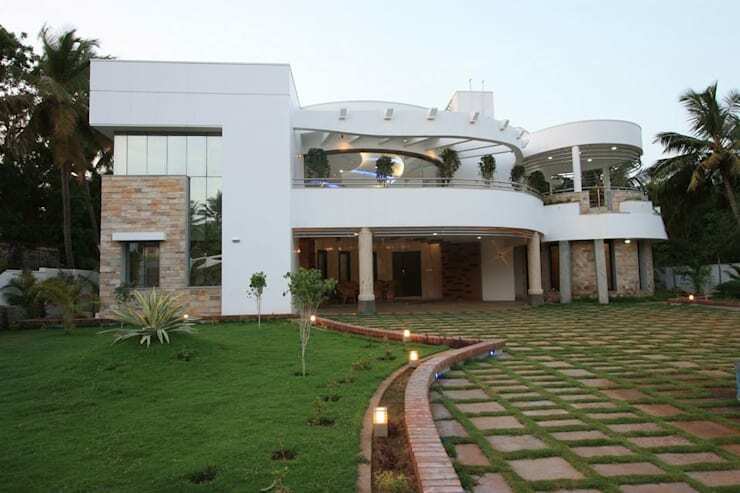 If you love homes with a generous touch of opulence, this mansion is for you! 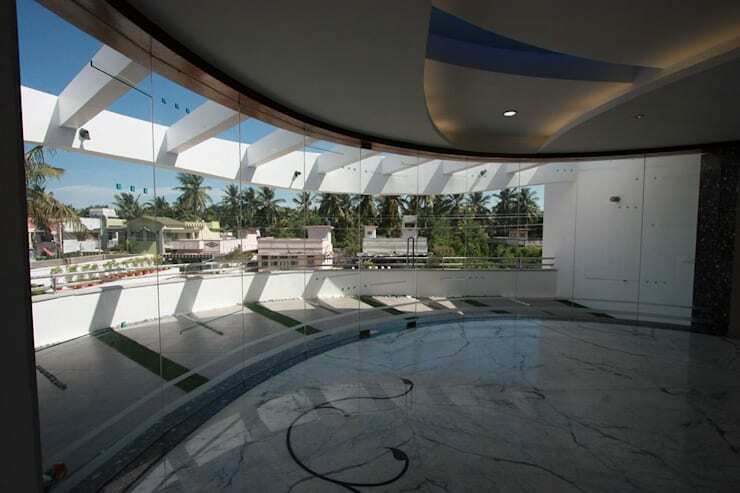 The curved concave facade presents an inviting appearance. As we can see, the curved balconies really invite the cool southern breezes into the home. The home is situated on a very busy road, so the main building has been set far back in the property and the front area has been simply landscaped. All the basic construction and landscaping materials are locally sourced. The spacious living room has a double-height ceiling and abundant daylight. This cuts down on the energy costs and creates a bright and breezy holiday-like feel to the home. This may be an elaborate home, but it's only used by the family part of the year. Nevertheless, the sofas have been custom made to suit the room and the floor and staircase are made from black and white marble. Of course, it's impossible to ignore the curvy ceiling, but we'll explore the small internal courtyard on the left first. The internal courtyard is two floors high and has a glass ceiling that invites diffuse sunlight into the home. The area invites nature in multiple forms into the home. We have walls covered in pale grey slate stone from Andra Pradesh. There are planter boxes running up the walls and simple, white stone gardens. 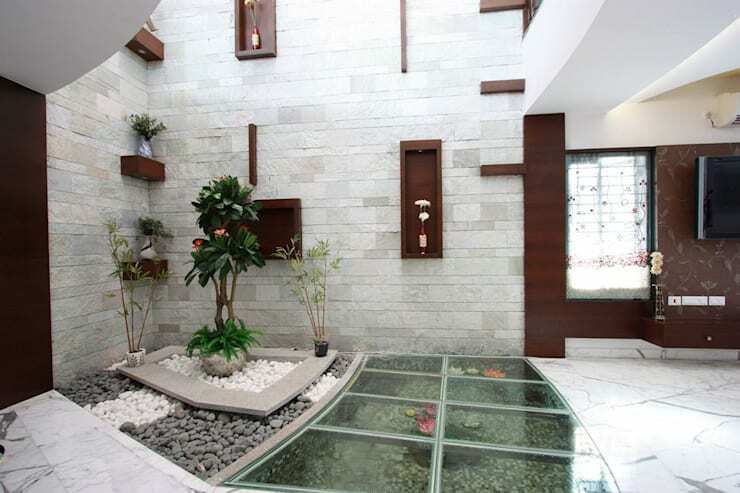 Of course, there is also a fish pond with toughened glass floor over which you can walk. At night, the fishpond is illuminated with underwater lighting. 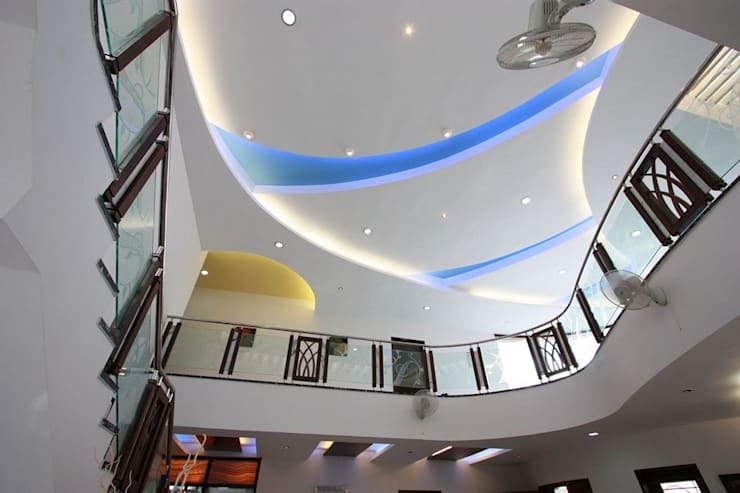 The curvy balcony and curved false ceiling panels work together to create a striking collection of shapes. Blue LED lights have been set inside the panels and the ceiling appears to float above the space. It is a lavish ceiling feature and one that is sure to encourage one to look upwards and appreciate the unusual, decadent feel of the home. The curvy balcony has a lovely tropical view. The glass wall is curved, minimalist and when it opens, there is nothing to obstruct the full power of the summer evening breezes to enter the home. A series concrete pergola beams run perpendicular to the curved glass wall. The home possesses four bedrooms (excluding the guest bedrooms). But it's the child's bedroom we will explore today. 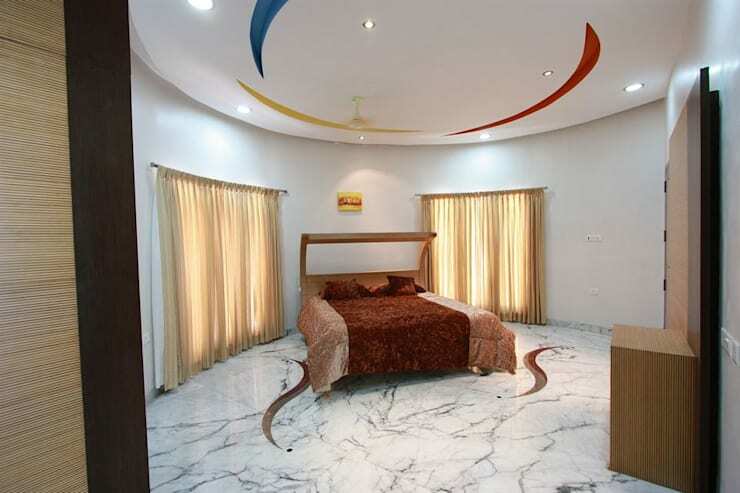 The curved bedroom is grand and a little bit playful. The marble floor has inset swirls of colour, reflected in the unusual ceiling patterns. This soft, playful touch is reflected in the curved headboard of the bed. This is certainly a lavish child's bedroom. We will finish our tour in one of the many bathrooms. The bathrooms were placed on the west side of the home to act as buffers and shield the house from the sun. Here we have a glimpse of the abundant natural light in these rooms. This light has been harnessed through the use of skylights. 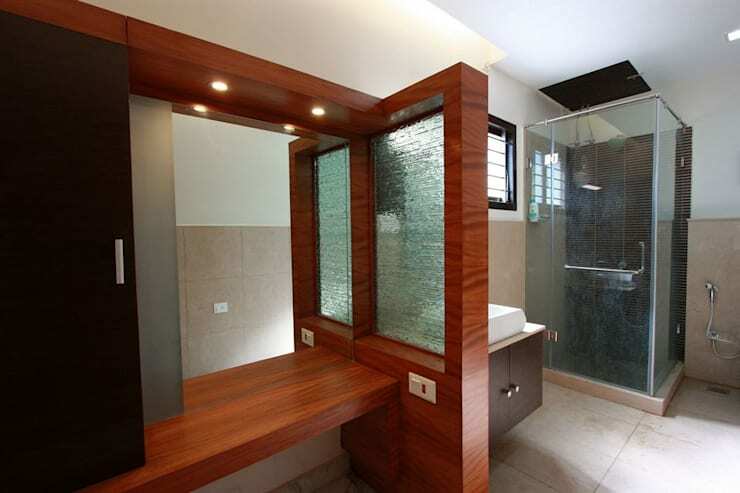 In all, the bathrooms are relatively subdued and luxurious. Each is finished in natural colours and contains earthy materials such as granite, marble and wood. 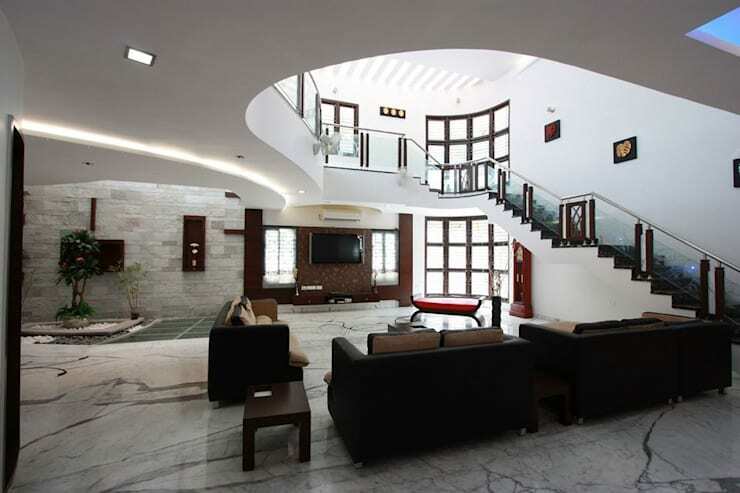 What do you think of this lavish curvy home? We would love to hear your ideas in the comments field below!